Brightening up the home with flowers seems like a fantastic idea, but indoor gardening can be challenging for beginners. Whether you do not have useable land to plant or winter is just around the corner, growing flowers indoors is an easy solution to keep your green thumb active. With a little practice and knowledge, you can master the hobby and find the right flowers for your indoor environment. Follow our indoor gardening guide to start cultivating fragrant floral accents for your home. When picking flowers to grow indoors, consider the level of care you are able to provide. If you take frequent vacations, find plants that need to be watered only once a week or less. However, if your gardening hobby is an important priority, you may be able to care for more high-maintenance flowers. Talk to a gardening expert about your expectations and current indoor environment. They can point you in the direction of plants that fit your lifestyle and brighten up your home. There are no general rules for how often you should water each plant or how much sunlight it needs, but understanding that every plant needs a few basic ingredients to survive is the first step to successful indoor gardening. Water, light, and a comfortable temperature range all help keep your flowers alive. Plants differ greatly and require a wide range of these necessary ingredients depending on the family of flower. Research your specific variety of flower to see the specific requirements for care. One tip for beginner gardeners is to use mature plants instead of seeds. Growing from seed greatly increases your likelihood of failure. Although not guaranteed, the flower has a better chance to thrive if already fully developed. Advanced gardeners may want to try their hand at growing flowers from seeds. Properly storing your seeds increases their chances of germination. Moisture and heat lessen your chances for successful growth. Keep seeds in a cool, dry place like the refrigerator. For more protection from possible moisture, place seeds inside a container with flour or powdered milk. This will prevent any moisture from reaching the seeds. Monitor sunlight and exposure for your flowers. If you notice the plant is not doing well, move the flowers to an area with a different amount of sunlight. Flowers getting too little light grow taller but become thinner as they try to reach the sunlight. 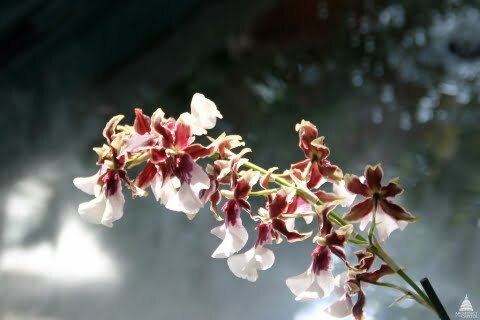 With too much light, the flowers develop white spots on the leaves because of “sun scalding”. Try a few different sunlight options to learn where your plants do best in your home. Flowers do well with a healthy dose of fertilizer at least once a month. Research your specific varieties to see how much and how often experts recommend using fertilizer. Take a break from fertilizing during the winter months and when the flowers bloom. Here are a few types of flowers that thrive indoors, providing beautiful blooms to gardeners without spacious yards or during the cold winter months. Add a touch of the tropics to your home with a Hibiscus plant. These huge, colorful blooms last only a few days, but the plant will blossom all year. For best results, keep soil moist and put this flower in a sunny spot. 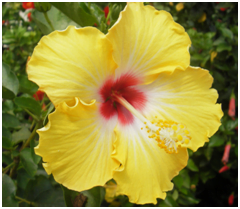 Hibiscus blooms can be white, pink, purple, yellow, or even blue. These gorgeous blooms flower year-round with very little effort. You can find African Violets in almost every color because of its wide varieties. These flowers like warm conditions and filtered sunlight. Avoid getting water on the leaves of African Violets, as this can cause brown spots to appear. If you want to start new plants, simply cut off the leaves of the African Violet and replant in a new pot. Peace Lilies blossom predominantly in the summertime, but select varieties will flower throughout the year. These iconic flowers require low light and humidity to thrive. This interesting hybrid between mandarin oranges and kumquats bears a small fruit that can be used to make homemade marmalade. The flowers on the Calamondin Orange tree are fragrant white blossoms. This tree does best with moistened soil, lots of sunlight, and 65–80 degree temperatures. Geraniums are very easy to grow, making them the ideal flower for indoor gardening beginners. There are many colorful varietals of Geraniums and they all need bright light, moderate temperatures, and dryer soil. The flowers on the Jasmine plant are very fragrant and are used commonly in lotions and perfumes due to their wonderful scent. The white blossoms thrive in bright light with lots of moisture. The Jasmine flower can also be used to flavor drinks, candies, and baked goods. Want more of a challenge with your indoor plants? Try cultivating orchids if you are a more advanced gardener. Here are a few tips for helping your orchids thrive throughout the year. Repot every year between blooms. Repotting refreshes the mixture used for planting and gives the orchid a fresh supply of nutrients. Use special soil made specifically for orchids when repotting. Orchids that grow in nature have much of their root system out in the open air. Regular dirt strangles the roots, preventing them from getting the proper nutrients and water. Dirt used to pot orchids should have a mixture of bark, moss, and light dirt to let the roots breathe. Using an ice cube every week to water your orchid is a myth. Orchids grow naturally in tropical regions. Why would ice be the best method for watering? To properly water your orchid, create a wet/dry cycle that mimics the flower’s natural environment by thoroughly drenching once a week. Give your orchids a small amount of fertilizer weekly, mixed with the water. Use half of what is directed on the box because orchids are very sensitive to fertilizers. Every fourth week, take off from fertilizing to allow the water to flush out unused fertilizer buildup. Buy from a reliable source, not the local grocery store. Orchids are not potted correctly at the store and cannot live long-term in those conditions. An orchid pot should have multiple holes in the side to prevent the roots from sitting stagnant in water or overly moist soil. Plastic or ceramic pots are both acceptable for growing orchids as long as there is proper drainage. Gardening is an easy and affordable hobby for all ages that can be done year-round indoors. Bring flowers into your home to add a touch of natural beauty and color. With a little knowledge and maintenance, you can create and sustain a wide variety of flowers in your indoor garden. Research your favorite potted plants before starting your indoor garden to find out all you need to know about caring for your flowers.